Place all ingredients except noodles in the Crock Pot. Cover and cook on low for 5 to 6 hours. 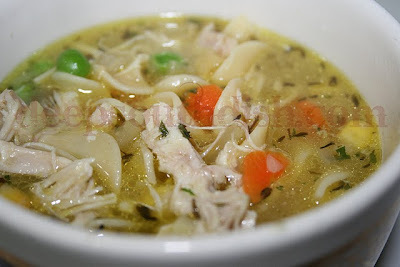 Remove chicken and bay leaf from pot; take meat from bones, dice, and return to broth, and add the noodles. Cook another hour or until noodles are done (about 1/2 hour on high). Or, cook the noodles separately and add them just before serving. Note: Two chicken breasts with bone work nicely for this recipe.